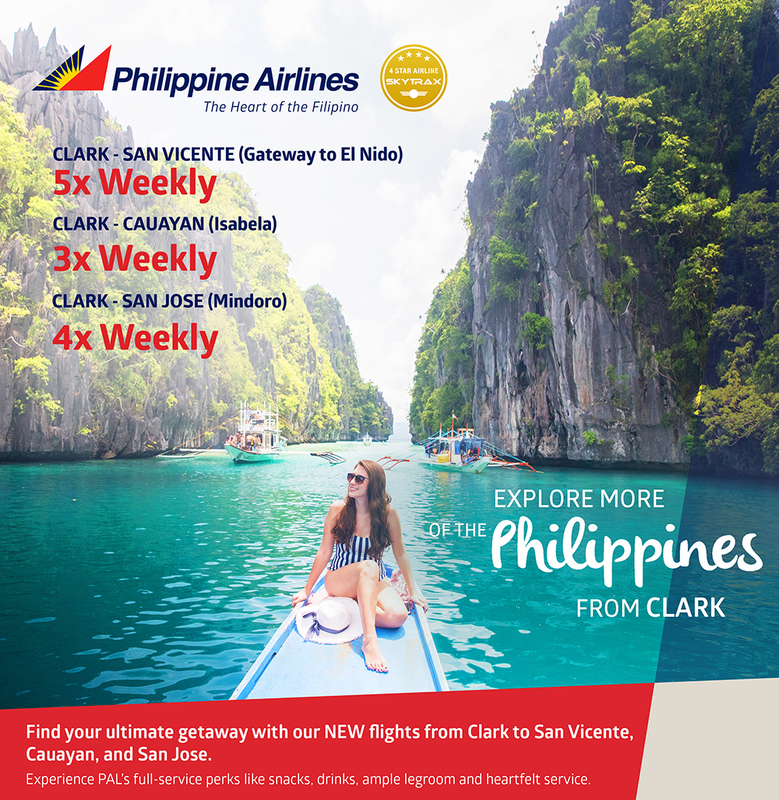 Philippine Airlines (PAL) continues to add new flights from Clark International Airport, Pampanga, with the opening of three new routes – Clark-San Vicente (Palawan), Clark-San Jose (Mindoro) and Clark-Cauayan (Isabela). Adding to the existing local flights includes Bacolod, Batanes, Coron, Cagayan De Oro, Catarman, Caticlan(Boracay), Calbayog(Samar) Cebu, Davao, Naga, Puerto Princesa, Siargao, Tuguegarao, Tagbilaran(Bohol) and Virac(Catanduanes). PAL’s brand-new 86-seater Bombardier Next-Generation Q400 turboprop aircraft which is fitted with six Economy Plus premium seats and 80 roomy Economy Class regular seats will be utilized in the 3 new routes. Services to San Vicente and San Jose began last October 28, 2018, while flights to Cauayan started on Oct. 30, 2018. Flights to San Vicente daily started last December 18, 2018. Flights depart Clark at 7:00 AM, arriving in San Vicente one hour and forty minutes later. PAL is pioneering regular flights to the newly opened airport at San Vicente, a first class municipality and gateway to El Nido in north Palawan. San Vicente’s 14-kilometer, white sand Long Beach is a fast emerging tourist attraction. San Jose in Occidental Mindoro will have four weekly flights on Monday, Wednesday, Friday and Sunday, leaving Clark at 11:00 AM. The return flight departs San Jose at 12:05 noon. Tourist atttractions in San Jose include Aroma beach, Ambulong and White islands, ancient burial caves and shell divers at Ilin island and Mt. Iglit National Park. Started last Oct. 30, 2018, three times weekly flights (Tuesday, Thursday and Saturday) to Cauayan in the center of Isabela are intended to help hasten economic growth in the country’s second biggest province. The Q400NG will leave Clark 11:00 AM, arriving Cauayan 45 minutes later. PAL used to fly the Manila-San Jose and Manila-Cauayan routes several decades back as two of the so-called missionary routes operated out of Manila. The decision to make Clark the origin for new routes to Mindoro and Isabela is a reflection of the flag carrier’s confidence in the emerging popularity of Central Luzon as an economic center and strategically important aviation gateway in its own right. “PAL made a big decision to invest in Clark. The Clark International Airport is not just a stop-over or refueling station. Clark is our fastest growing hub airport, center of a network of flights that connects the country,” said PAL Express President Bonifacio U. Sam. With a network of 18 domestic destinations and one international route (to Seoul Incheon), PAL has strengthened its position as the biggest airline operator out of Clark International Airport. No longer just an alternate aerodrome to help decongest Manila’s Ninoy Aquino International Airport, Clark is now recognized as PAL’s fastest growing hub airport. Clark has overtaken Cebu – another PAL hub of operations – in number of domestic points linked: 15 domestic destinations from Cebu, 18 from Clark. PAL started developing the Clark hub in December 2016 with a flight to Caticlan. The first PAL international flight from Clark was to Incheon, South Korea, in January 2017.